The Children in Nursery, Reception and JC had a surprise visit just now from a shoe box of one day old chicks!! They have been chirping happily as the children held an stroked these fluffy little chicks. Thank you to Mrs Kirk for bringing in this last minute treat for the children. As you may have seen, class AB have been growing runner beans in their outside area. We have been lucky to get some beans before we break up from school. The class decided that they would like to try the beans and wanted to have them for their lunch, so we asked Mrs Aldred whether she would cook them for us. 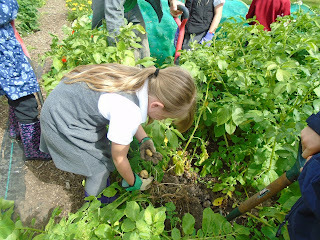 Here are some pictures of us enjoying our runner beans. Thank you Mrs Aldred for cooking our runner beans! We ALL enjoyed them and thought they were yummy! As part of the current project on ancient Greece, clases JA & VW have been creating some fabulous sculptures of olympic athletes in action. They used twisted newspaper to shape their design, then covered in foil to keep the shape then added layers of modrock to build up a solid figurine, finally standing on a clay display stand. Just a few images below - can you spot the Olympic event they are taking part in? Our terrific boys choir, who have been coached this year by Drew Cantrell, the professional choirmaster from the Phoenix Singers, sang some spine tingling songs to the school in the assembly, this morning. They performed some wonderful renditions from well know musicals including The Sound of Music and Oliver. Well done boys! Why don't birds get wet when it rains? Today class AB created an experiment to see why birds don’t get wet when it rains. We dripped water onto the feathers and observed what happened. We talked about how the feathers could be waterproof or water resistant. We also talked about what could happen if the feather were absorbent. The Year 4 pupils who've been learning the Cornet this year, gave a lovely concert today combining singing and playing to delight the audience with some well known songs. Mr McDowell, our brass tutor from the County Music Service will be back with us in September to teach next year's Year 4 pupils and also some of these pupils who have decided to 'Play-On'. On Friday last week we decided to take our bears on a Teddy Bear’s Picnic. We made our own sandwiches and labelled our sandwich bags. As it had been raining we then decided to go exploring in school to see if we could find a good place for our Teddy Bear's picnic. We looked along the corridor and saw all the pegs and the toilets for classes KM and CH and looked in their classes. We then went upstairs and found some lovely blankets in one of the year 6 class rooms, perfect for our picnic and we found our bears there too! We enjoyed our sandwiches, fruit and tomatoes and had some cucumber that Mrs Eyles had grown in her garden. Last Wednesday we decided to do some exploring and go on a bear hunt! We shared the book 'We're going on a bear hunt' by Michael Rosen, joining in with the words and exploring the feel of grass, water, mud, being in a forest and a snowstorm before finding a cave in the outdoor area that was full of bears! Some of the bears actually belonged to our children which was very exciting. We then had a picnic snack outside with the bears too. The children were congratulated by the Suffolk Wildlife Trust Staff for the fantastic attitude and behaviour and the school staff are incredibly proud of the pupils too. Thank you to our volunteers who gave up their time to support this field trip; we are extremely grateful. On Monday the Girls Cricket Team travelled to Woolpit Cricket Club to compete in the Kwik Cricket County Finals. The competition featured the top 12 primary schools in Suffolk who had qualified for the tournament by winning their respective district rounds earlier in the Summer Term. After a slow and unsuccessful start in their first two matches the team made fast improvements and rallied to achieve comfortable victories over Forest Academy, Horringer and St Mary's Ipswich. The team also achieved a notable draw against a very strong Kingsfleet side from Felixstowe who finished in the top 3 places of the competition. Much praise and congratulation must go to the players for their outstanding performances, efforts and improvements in training, teamwork, fast decision-making and fantastic ability on the day. Very well done indeed! Special thanks also to all parents who attended as well as Mr Trimby and Mr Skeggs for their excellent support, encouragement and advice on the boundary throughout the days play. Thank you. “This year we celebrate 40 years of Sir Robert Hitcham’s and Whitwell Hall – the longest running relationship with any school. Mr Byer started this tradition way back in 1977 – the year the Queen celebrated 25 years as the Monarch (Silver Jubilee) and a British woman won Wimbledon. Mr Brook was only 13 years old! Over those 40 years the experience of being at Whitwell has not changed much. Some of you will have had parents who came here. Indeed a few years ago there were 10 children whose parents had been to Whitwell with Mr Byer. Whitwell is meant to be basic: camping, fresh air, open fires, no electricity, TV or other electronics. And no shop! There have been some improvements: the food is much better, the shower block did not exist 10 years ago and there is now a broader range of activities including the seal trip and day at the beach. The t-shirts and hats were introduced by Mr Brook 9 years ago who joined us when Mr Byer ‘retired’ as a teacher after 31 year 6 camps. Traditions like year 6 camp are not easy to keep up. They rely completely on having staff and volunteers that are willing to camp and work for 24 hours a day. Most schools don’t run trips like this anymore because they can’t get the staff to do the extra work. Why then does SRH still do this? It is because the staff involved really enjoy it as well and because they all think it is a brilliant thing for you all to experience. Year 3, 4 and 5 had an educational morning in and around the Castle on Friday exploring three different activities. Unfortunately due to the weather, we were not able to go ahead with the planned KS2 assembly on the castle meadow as the rain was trying its hardest to ruin our morning… however… best of British!! We were determined not to be beaten and enjoy our morning, we headed off en masse. There were three activities:- a treasure hunt inside the castle looking for clues about the history and learning about the importance of the castle; Mr Bennet-King adapted the planned rounders game to enable a safe activity that all the year groups enjoyed to enhance teamwork and there was also a drama-based activity, where the children were able to rehearse and perform their favourite Ancient Greek myths to each other. Everyone really enjoyed the morning enhancing their learning about the various areas of the curriculum. Thank you to all the parent helpers and volunteers who made this possible. Gardening club – What a feast! Gardening club have been busy weeding the beds and harvesting the crops on the school vegetable plots at the Community Gardens. Radishes, lettuce, red onions and garlic were harvested last week for salads. This week, the potatoes were harvested with ample supplies being shared amongst our keen and hardworking gardeners. Mr Duggens and Mr Seeley provided a small picnic of home-grown mange tout, sugar snap peas, carrots and home-made broad bean humus which everyone enjoyed. Yum yum!! We would also like to say a huge thank to Mr Duggens and Mr Seeley for giving up their time to share their expertise and knowledge with the gardening club. It is really appreciated and we look forward to seeing how all the crops have grown over the summer when we return in September. Class LH and Class SC uncover some hidden gems!